SPRUCE CREEK, FL - The world's only aircraft and vehicles Christmas parade was held this Saturday at the Spruce Creek Fly-In. Showcased on the grounds of this world famous residential airpark community, the Spruce Creek Toy Parade has grown from an annual event held by a few neighbors to today's festival with thousands of spectators. Stretching for almost a mile, this year’s procession included a myriad of creative decorations participating in the parade. Virtually anything that can fly, walk, drive or float: airplanes, antique cars, golf carts, motorcycles, go-carts, bicycles, boats, pets and even wagons decorated by children. The event was started promptly at 1:30 pm with a performance by the Spruce Creek Gaggle Flight Team with a mass take-off unique in the world. Once in the air, the airplanes lined up in several formations and paraded to the delight of the spectators in a veritable aerial ballet. The Gaggle was followed by the Mavericks with a demonstration of precision formation flying maneuvers. The Mavericks team is led by former Navy pilot, Bob Gantt. Gantt is an accomplished writer with many successful books mixing fact and fiction drawing from his long experience as an aircraft carrier fighter pilot and later as Captain for Delta Airlines. After the main parade, neighbors gathered around "The Tree", a beloved 150-yr-old Sand Live Oak in Windsock park, the traditional gathering place at the Fly-in. There was a large picnic together with hotdogs, refreshments, snow cones and other goodies provided free of charge to all attendees. An event of this size couldn't occur without substantial planning and participation. The event is organized by the Spruce Creek Flying Club and a virtual army of volunteers. Grand marshals of the parade were Ron and Evelyn Shapiro. Spruce Creek's own, Dr. John McCollister was the parade announcer. McCollister is a prolific writer with many books to his credit as well as a nationally recognized arbitrator and public speaker. The large number of volunteers and the flawless celebration that rivals the best productions of billion-dollar cities is a testament to the tightly knit community that makes Spruce Creek so special. The parade was followed by a wine and Hors d'ouvres and treats hangar party sponsored by Kenny Garguilo and his Downwind Cafe, One of Spruce Creek's two restaurants and home of the best pizzas in the area. 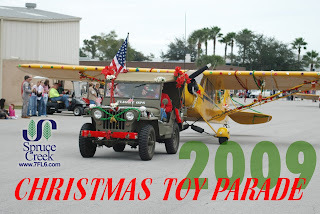 The Spruce Creek Toy Parade is the only known airplane parade in the world other than the AOPA Convention parade and has gotten bigger and better every year. This year there was not one but two WWII Mustang P51 fighters. Jeff Michael did several fly by's in his beloved P51 "Obsession" and Conrad and Gary Yelvington's prized "E Pluribus Unum" was on the static display. Even Santa Claus came early getting ready for his big night. He was spotted taking gift requests from the kids. Prizes were awarded for the best decorated examples in the various categories. With very few exceptions, all aircraft and vehicles are owned by residents of the Spruce creek Fly-In. It is widely known that Spruce Creek has one of the largest pools of very experienced military, airline and civilian pilots that exists anywhere. Today, almost 5,000 residents, 1,300 homes and 700 hangars share a unique life in this private gated village. Truly a piece of pilot's heaven. A championship golf course and Country Club and 24-hr patrolled security complements the safety, privacy and enjoyment of their residents. John Travolta and many other celebrities have enjoyed the Spruce Creek Fly-In lifestyle and privacy. Learn more about the Spruce Creek Fly-in. Upon arriving in Big South Fork country, you will find that a deep breath of fresh air and the sound of rushing rivers will melt away all of your worries. The sheer natural beauty of Big South Fork country is awe-inspiring and comforting. When we saw the breathtaking views, captivating beauty, and serenity of the forests, we had a vision. Our vision combines the beauty of the Big South Fork River and Recreation Area with a passion for flying, riding and a love of the outdoors. At Big South Fork Airpark you have the unique opportunity to be one of few individuals that live the aviation and equestrian dream. We designed our fly in community to offer a balance of open spaces, stunning views and all of the amenities you would expect. Come experience the joys of being with friends and family while surrounded by the wonders of nature.